Your creature rips into a target with less than 30% health, dealing <<1>> kinetic damage. Your creature cuts the target, causing it to bleed for <<1>> internal damage over <<2[%d seconds/%d second/%d seconds]>>. 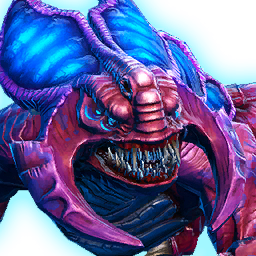 Your creature slams into an enemy target, dealing <<1>> kinetic damage to it and up to 4 additional enemy targets within 4 meters. Your creature lunges at the target and delivers a powerful bite, dealing <<1>> kinetic damage and immobilizing the target for <<2[%d seconds/%d second/%d seconds]>>. Your creature lunges at the target and delivers a powerful headswipe, dealing <<1>> weapon damage, heals for 25% of damage dealt and generates a moderate amount of threat. Fires a multi-grapple line from your creature's collar that fires in a wide cone in front of the creautre and pulls the closest three targets and generates a high amount of threat. Only affects targets that are in combat and are not in cover or have Boss Immunity.